This is an article from Doll Reader December 1988/January 1989 written by Ann Bahar. In the 1740s, "Gay Paree" delighted in a cardboard novelty which the French believed had been invented at the nearby village of Pantin. 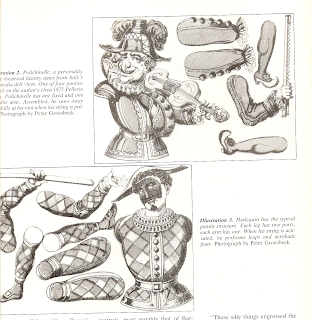 In fact, the pantin, which is a direct ancestor of today's paper doll, had a venerable genealogy which dates from ancient Egyptian string operated marionettes and includes 15th to 19th century German jumping jacks. 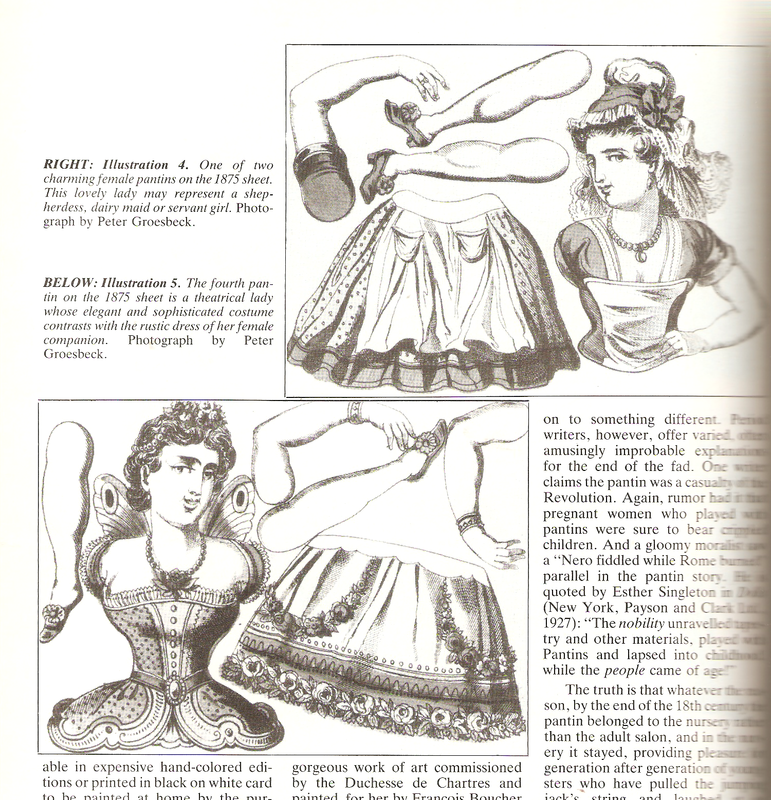 However to the 18th century Parisians, the pantin was their toy, a salon amusement par excellence, a bibelot that served the flirt as readily as it seved the political satirist. 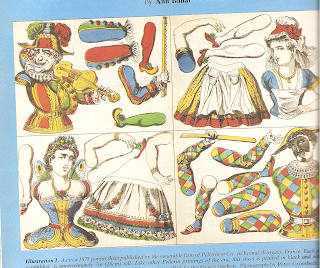 Several vivid period accounts of the pantin craze have survived in old journals, most notable that of Barbier who wrote in his Journal (1774): "At first the Pantins were designed for children's toys; but after a time they were used to amuse the entire public. They were little figures made of pasteboard. All parts of the body were separte and were attached by strings at the back of the figure. When these strings were pulled, the arms, legs, and head were all jointed together and the Pantin could be made to dance. These little figures represented Harlequin, Scaramouche, Mitron, Shepherds, Shepherdesses, etc., and were painted by good artist, amoung them Boucher.."
"These silly things engrossed the attention of all of Paris, amusing everyone to such an extent that you could not go into any house in January 1747, without finding a Pantin hanging by the mantelpiece. Pantins were given as presents to all the women and girls and the rage for them was so great at the beginning of the year that all the shops were filled with them for New Year's gifts." 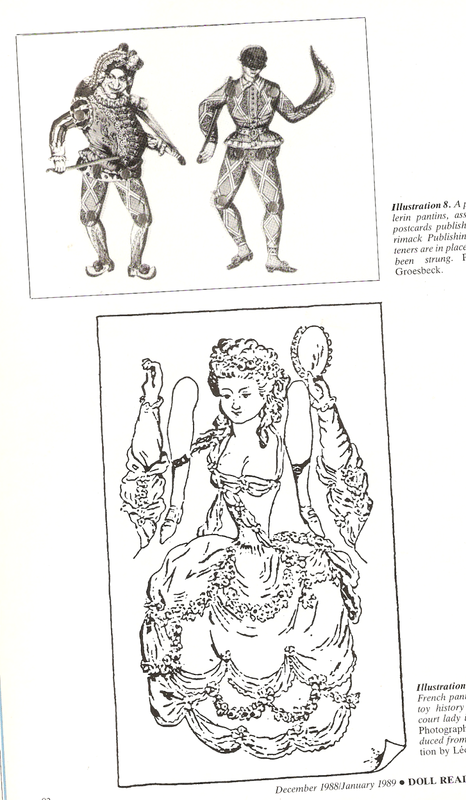 Barbier continues, describing how the craze for these paper novelties spread from Paris to provinces in sizes ranging from 4 in to 28 in and were available in expensive hand-colored editions or printed in black on white card to be painted at home by the purchaser, a French 18th century predecessor of the "penny plain tupeence coloured" toy theater sheets beloved by English schoolboys a century later. However, pantins were priced far higher then the theater sheets young Winston Churchill would paint in his English nursery and the child Robert Louis Stevenson would collect in Edinburgh. 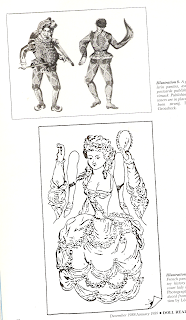 Cheap unpainted and unassembled pantins sold in shops for 4 sous; the most costly, whose shadowy history includes little more information than its fabulous price, was a gorgeous wok of art commissioned by the Duchesse de Chartres and painted for her by Francois Boucher to the tune of 1500 livres. Whatever legends exist to explain the advent of the pantin craze in Paris, part of the truth lies in 18th century advances in science of paper manufacture which made possible increased production and decreased cost to the consumer. This, in turn, led to numerous experiments, and paper toys proliferated during the first decades of the century. The demise of the pantin probably came about because, as with every fad, society tired of its current toys and moved onto something different. Period writers, however, offer varied, often amusingly improbable explanations of the end of the fad. One writer claims the pantin was a casualty of the Revolution. 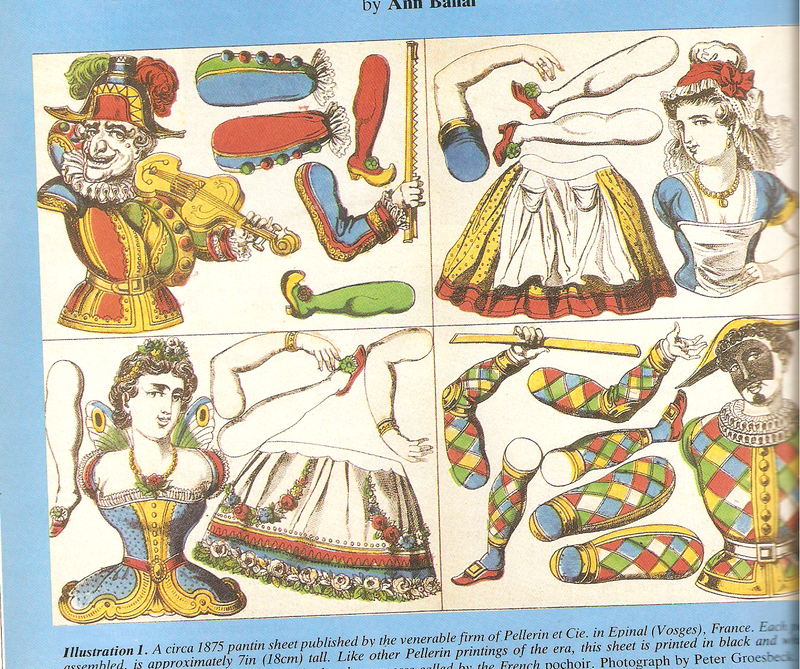 Again, rumor had it that pregnant women who played with pantins were sure to bear crippled children. And gloomy moralist saw a "Nero fiddeld white Rome burned" parallel in the pantin story. He is quoed by Esther Singleton in Dolls (1927): "The nobility unraveled tapestry and other materials, played with Pantins and lapsd into childhood, while the people came of age!" The truth is that whatever the reason, by the end of the 18th century the pantin belonged to the nursery rather than the adult salon, and in the nursery it stayed, providing pleasure for generation after generation of youngsters who have pulled the jumping jack's sting and laughed at its unpredictable antics. A rare exception is the young Dickens, whose tale, "A Christmas Tree" recounts his terror at the gyrations and leaps of what, to his impressionable child eyes, was a fearsome living monster. Of the many publishers of pantins down the years, the most famous is surely Pellerin, a firm which has been owned by the founder's family for more than 200 years. Pellerin first published religious images, political prints and caricatures, but governments changed so rapidly in 19th century France that a politcal squib which brought its creator fame and profit one year could land him in jail the next. The Pellerins learned by mid century that it was wiser (if less exciting) to focus production on non-controversial paper toys for the nursery. 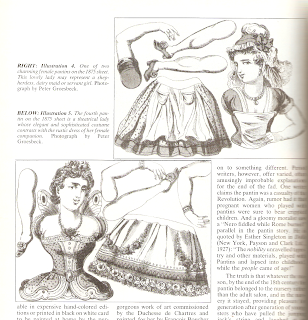 Amoung the wealth of gorgeous now highly collectable paper dolls, architectual construction sheets, and ombres chinoises which Pellerin has issued since the 1860s, were a number of delectable pantins. Recently, we acquired a beautiful circa 1875 pantin sheet produced by Pellerin and featuring four separate figures,- Polichenelle, Harlequin, and two lovely ladies. Like all the Pellerin printings from this comparatively early period, ours is printed in black on fragile lightweight stock. Each of the four figures, made up, measures approximately 7 in tall. Color (very bright!) is hand-stenciled onto the sheet, a method appropriatly called pochoir by the French. The technique is imprecise to say the least and adds much to the fold art quality of the final product. Colors ten to bleed into one another, land outside or fall short of the bounds of the design. Smears, and blots are common, yet all this merely heightens the charm of such paper treasures hold for the modern collector. They recall the human presence of the old designers, printers, and of the nameless poor of Epinal who spend endless gas-lit hours sponging reds, greens, blues, yellows, and violets onto paper printed by their employer. S'il vous plaisait en dansant"